Bonnie Randall, right, and her husband Robert (not pictured) began clearing snow from the driveway of their Brewer home Wednesday morning as the snow started to ease up. Randall’s neighbor Mark Bishop, left, came over to help out, after he was finished at his home. After a two-day nor’easter dumped more than a foot of snow in Maine — with two feet in many areas — residents across the state started digging themselves out Wednesday afternoon to get ready to go back to school or to work on Thursday. The heavy snow caused a derelict waterfront building in Lubec to collapse — the second such building in Lubec to sustain significant storm damage this winter, after a former brining shed fell into the water during a Jan. 4 blizzard and floated across the Canadian border to Campobello. The former Puss ‘N Boots Cat Food factory on Lower Water Street apparently fell in on itself sometime overnight Tuesday, according to Chase Fitzsimmons, a 25-year-old Lubec man who lives nearby. Snow was still coming down Wednesday afternoon in much of the state, and winter storm warnings remained in effect for northern, inland eastern and mountainous western Maine. According to the National Weather Service, another three to seven inches of snow is expected to fall overnight in far northern Maine and in the mountains of western and central Maine. A winter weather advisory for the Portland area, central, midcoast and parts of western Maine was due to expire at 8 p.m. Wednesday. The biggest two-day snowfall totals were for Little Lyford Pond in central Piscataquis County and Copeland Hill in Holden just outside Bangor, each of which got 30 inches of snow, according to the weather service. Less than a week ago, another nor’easter dumped about a foot of heavy snow throughout much of the state. Pete Rahe, a meteorologist in the weather service’s Caribou office, said Wednesday afternoon that another storm might hit Maine next week, though which track it might take is not clear. It could drift east further to the south, making it a mostly a rainstorm for southern New England, or it could come further north, bringing some snow but maybe also rain to Maine. He added that the deep snow cover Maine got Tuesday and Wednesday likely will stick around into next week, as temperatures right around freezing are expected to settle in for a few days. “It’s not going to melt right away,” Rahe said. Several places in eastern Maine, ranging from the Bangor area to east along the coast to Machias, got two feet of snow or slightly more since midday Tuesday, according to the weather service. Parts of Oxford and inland York counties also got two feet of snow. All of Maine except for the northeast corner got a least a foot of snow Tuesday and Wednesday. 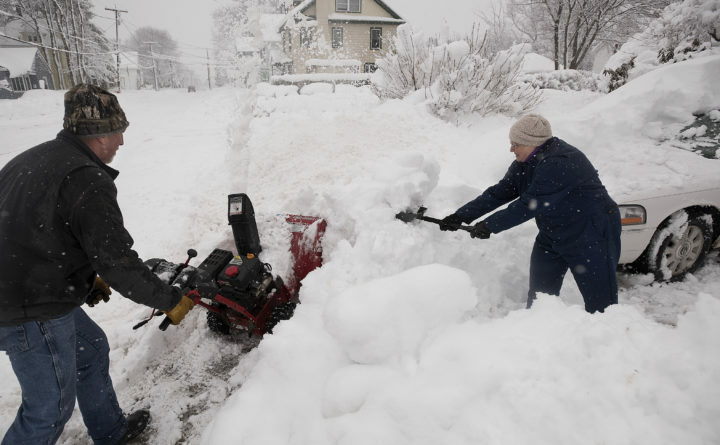 The southern coast, midcoast and central Maine — including Portland, Lewiston, Augusta and Waterville — got between 12 and 18 inches. In Aroostook County, as of 4 p.m. Wednesday areas roughly east of Fort Kent and north of Houlton got less than 12 inches, with snowfall totals shrinking down to as low as 2 inches around Presque Isle. Many schools and offices were closed for part of Tuesday and all of Wednesday as people hunkered down at home to stay off the roads. A blizzard warning was issued Tuesday for the entire coast as strong gusts of winds blew newly fallen snow across roads and made visibility difficult. The storm caused scattered power outages throughout most of Maine, though there were few if any in Aroostook County. Central Maine Power had approximately 8,000 outages Wednesday morning but had reduced them to around 300 early Wednesday evening. Emera Maine had more than 14,000 outages around noon Wednesday, mostly in coastal Hancock and Washington counties, and by late afternoon had reduced that number to around 7,200. This week’s storm was the third nor’easter to hit the Northeast this month and the biggest of the three in terms of snowfall for Maine. A March 2 storm battered the New England coast with high tides and powerful winds, knocking out power to an estimated 2 million electricity customers in the Northeast. Last Thursday, much of Maine got roughly a foot of heavy snow and approximately 27,000 Mainers lost power, most of them in York County.